Your way is the best way. As a power user, you want the tool to adapt to your way of working, not the opposite. Flexibility in every aspect is what you are looking for. Whatever your style, whatever your preferences, dw-2000� can be adapted to your needs. If you like a Microsoft style user interface, we have it for you. If you were trained on a Calma interface and want to use it, it is available to you. And if you have a personal style, whatever it is, we are convinced that you will be able to customize dw-2000 to match your preferences. 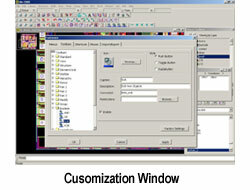 The dw-2000 graphical user interface is completely customizable, allowing users to create or modify the menus, toolbars, shortcut keys, etc. You can even create your own completely new dialog boxes. And because dw-2000 is built around a powerful programming environment made available to you, the functionality you can assign to your customized user interface is almost limitless. The flexibility of dw-2000 is one of the features experienced designers appreciate the most. We always get great feedback from our users about it. We hope you will appreciate it too!